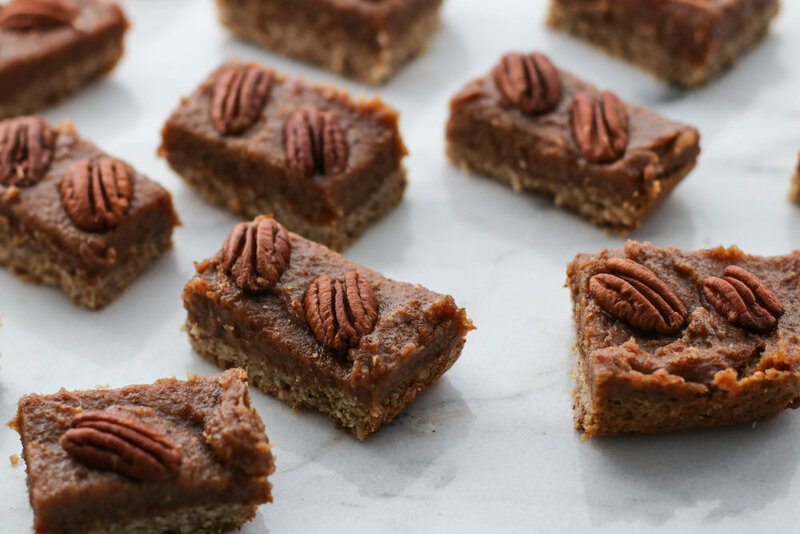 Pecan Pie Shortbread Bars — Erin Parekh | Live Well, Simply. My grandmother's pecan pie is epic. It's literally the best pecan pie ever, and I still thoroughly enjoy a slice when my mom makes it for the holidays - Karo syrup, butter, and all! Seeing as how this blog is a tribute to Gee, it seemed fitting for me to make a naturally sweetened version to share with you all. It's loaded with pecans, a must-have gooey filling, and will definitely cure a sweet tooth. In the bowl of a food processor, pulse nuts and oats until a relatively fine flour forms. It's okay to have some larger bits for texture. Add in the coconut oil, maple syrup, and sea salt. Pulse until well combined and the mixture sticks together when pressed between your fingers. Transfer dough to prepared baking dish and press down firmly so that if evenly fills the entire pan. I use the back of a measuring cup to ensure it's compact and even. Bake on the middle oven rack for 20-25 minutes until crust is light golden brown around the edges and the middle looks set. Cool for 10 minutes while you make the filling. *Soak in warm water or 10-20 minutes. Drain well and save the liquid. Run pecans through the food processor until very finely ground and almost turning into a nut butter. This will take several minutes - scrape down sides as needed. Add in dates, vanilla extract, cinnamon, salt, and 2 tablespoons date water. Pulse until a thick and creamy mixture forms. It should be easily spreadable, but not liquid-y. Add additional date water as needed to thin. The filling will set up slightly once chilled, but not much. Pour filling on top of cooled crust and spread evenly to edges of pan. Arrange toasted pecan halves on top of filling. Refrigerate finished bars for at least 1 hour. Cut into squares and enjoy! Bars will keep in the fridge, well sealed, for up to one week. Or, freeze them between layers of parchment paper for up to 2 months.